Portable storage provides the most innovative solution to moving and storing available today. It allows you to completely customize your experience from start to finish—including how many portable storage units you need, how long you need them, what to store, what to move, and more! 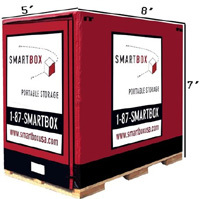 In Maryland, Northern Virginia, and Washington, DC, there’s only one name you need to know for portable storage, and that’s SMARTBOX! Find out how much storage you’ll need by using our space estimator! Still have questions? Give us a call at 301-683-6111 or contact us online! Moving is already stressful enough—why add to it with the hassles of a traditional moving company? There’s no need to rush and load all your belongings onto a moving truck in one day or trust a stranger with that box of delicate china. Portable storage from SMARTBOX allows you to take all the time you need packing and loading. We’ll deliver your storage containers to you and let you hold onto them as long as you need—meaning you can pack weeks in advance. You can organize the storage units to your exact specifications, and when you’re ready, our team will pick them up! When you need self-storage, you shouldn’t have to load all your boxes and belongings into a moving truck or your car, only to unload them and have to put them in your storage unit. When you use portable storage from SMARTBOX, you only have to load your boxes once, and you can even do it from the comfort of your own home. We will bring our portable storage containers to you and you can take all the time you need filling them with your belongings. When you’re ready for them to be taken to our secure storage facility, just pick up the phone and we’ll be on our way! No matter why you need portable storage, SMARTBOX is the perfect solution. Our storage units come equipped with a sliding hasp built to accommodate a padlock or combination lock, as well as an all-seasons weather-resistant cover to protect your belongings from the elements.